It looks like Flash Philippines isn’t one bit done with all of the price cuts for the well-received Flash Plus 2 and it looks like the promotions aren’t stopping any time soon to keep the hype up for the bang-for-the-buck smartphone going. This time, it is the 2GB/16GB variant stepping in the spotlight. 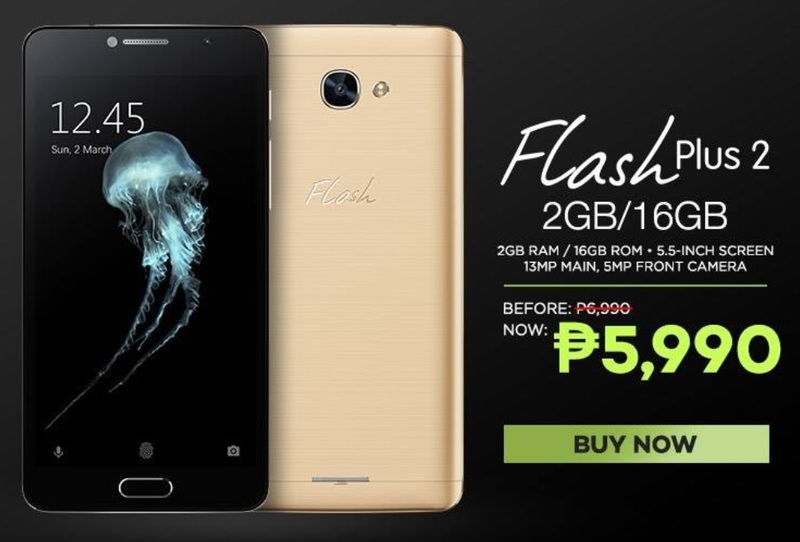 Priced at Php5,990, the Flash Plus 2 is one of the most powerful handsets in its price range. If you have been out on the loop, the Flash Plus 2 features a capable hardware specs sheet as well as enticing features. It comes with a speedy 64-bit Helio P10 chipset, a 5.5-inch display with Full HD resolution, a 13MP primary shooter with f/2.0 and mixed autofocus. It also runs on Android 6.0 Marshmallow, too! Furthermore, it even comes with a fingerprint scanner to help you keep things secured without much of a hassle. But of course, do keep in mind that duration for such promotions don’t exactly run forever, in fact, it will only last until the end of the month. It could go back to its original price tag after that, or another handset could be in the works to keep its price on the down low. Either way, we’re happy with this one. If you want one, better check the Lazada listing now!